The Turf Club Bar and Grill at Disney’s Saratoga Springs Resort serves a chocolate espresso torte for dinner. This Disney recipe is slightly different from the one at the restaurant. The Turf Club's version is served with raspberry sauce and vanilla port wine ice cream. Tortes are very similar to cakes but the cake has been cooled, glazed, and garnished. Also it is made with little to no flour, so it can often be enjoyed by those on a gluten-free diet. As always, ask to make sure. This recipe is a perfect example of a torte with no flour. Preheat oven to 300º with oven rack in middle position. Wrap a 9-inch springform pan in plastic wrap, then wrap tightly with a layer of heavy-duty foil. Generously butter pan. Dust pan with sugar, tapping out excess. Place prepared pan in a roasting pan; set aside. Combine 3/4 cup sugar and prepared espresso in a small saucepan over medium heat. Heat, stirring, until sugar is dissolved. Set aside to cool for 10 minutes. Place chocolate in a large bowl set over a large saucepan of barely simmering water (do not allow bottom of bowl to touch water). Stir occasionally until just melted. Add butter by the tablespoonful, stirring until combined. Stir in espresso syrup and vanilla extract. Set aside to cool slightly, 4 to 5 minutes. Gently stir in eggs until combined. Pour batter into prepared springform pan. Pour boiling-hot water into roasting pan until it reaches three-quarters of the way up the of springform pan. Bake until center of torte is almost set, but still wobbles just slightly, about 45 to 50 minutes. Transfer torte to a wire rack to cool completely. Refrigerate, covered, for 8 hours or overnight. Place chocolate in a medium bowl set over a medium saucepan of simmering water (do not allow bottom of bowl to touch water). Stir occasionally until melted. Set aside to cool slightly, 3 to 4 minutes. Add butter by the tablespoonful, stirring until combined and glossy. Use immediately. Run a thin knife along edge of chilled torte, and remove springform pan ring. Set torte on a wire rack set over a sheet pan. Pour ganache over torte, a bit at a time, spreading with a rubber or offset spatula to cover top. Allow excess to drip down sides, if desired. Place torte on a platter or sheet pan lined with parchment paper, and refrigerate until set, approximately 2 hours. Cut individual tortes from large torte using a heart-shaped cutter. 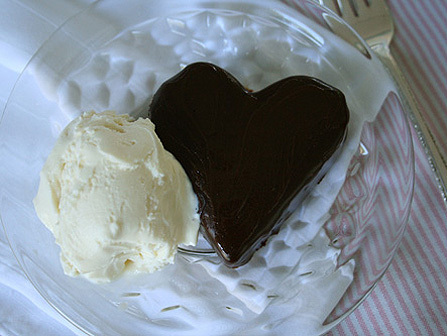 Carefully dip each heart into ganache using two forks, letting excess drip off. Set hearts on a sheet pan lined with parchment paper, and refrigerate until set, approximately 2 hours. Serve with a scoop of vanilla-port wine ice cream, if desired.